Zapier is a powerful tool used to connect all your apps, improving and automating your workflow. With this latest product update, we’ve connected the power of Zapier to Zoom.ai so you can create up to 5,000+ different flows all within your favourite chat platform. In just a few steps, you can connect to over 1,000+ apps and easy integrations. This latest update enables enterprise employees everywhere to off-load tasks and access all of their tech stack within one singular access point. 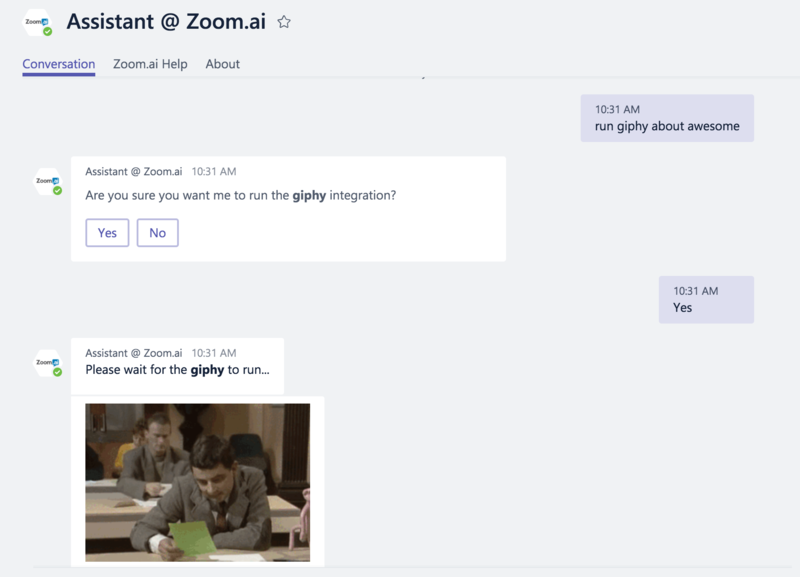 The Zoom.ai assistant acts as an intelligent middleware that rests between a company’s chat application and their entire tech stack, increasing productivity and flexibility. Are Zoom.ai Integrations for you? The Zapier integration allows enterprises to easily build expansions and expand their daily capabilities. If you’re an organization that relies a host of applications to perform your day-to-day tasks and are experiencing an overwhelming amount of task-switching, here is how you can easily streamline all your repetitive tasks. Enterprises on Zoom.ai can access their administrator settings to set up Zapier zaps. These special recipes will help you create a workflow from any app to your Zoom.ai chat window. Trigger the workflow movement by commanding your assistant to run the flow and finish routine tasks automatically, streamlining your day with just a few clicks. Zapier integrates with apps such as, JIRA, Quickbooks, Google Sheets, Google Docs & many more! Coupled with Zoom.ai, this integration’s functionality will connect you to the apps you use everyday. Contact us to learn more about how to use Zapier and Zoom.ai together. We can help you work better.